My last paper entitled “Transition Spillovers? The Protest Behaviour of the 1989 Generation in Europe” is now available on SocArXiv. The paper is available here and the replication materials are available here. This paper re-examines the well-documented gap of political participation between citizens of Western Europe and citizens of Central and Eastern Europe. Building on political socialization theory, it explores whether the deficit of participation in post-communist countries is moderated by previous experiences of mobilization. The study focuses on the protest behaviour of the 1989 generation, which is composed of citizens who reached political maturity during the collapse of communism. RQDA lets you use the powerful machinery of R. Also, simply by being free and open source, it facilitates the diffusion and reuse of qualitative material and makes qualitative research more traceable. At the WZB, as part of a project on the AfD (the new radical right party in Germany), I recently had to analyze CVs of Members of the Bundestag. 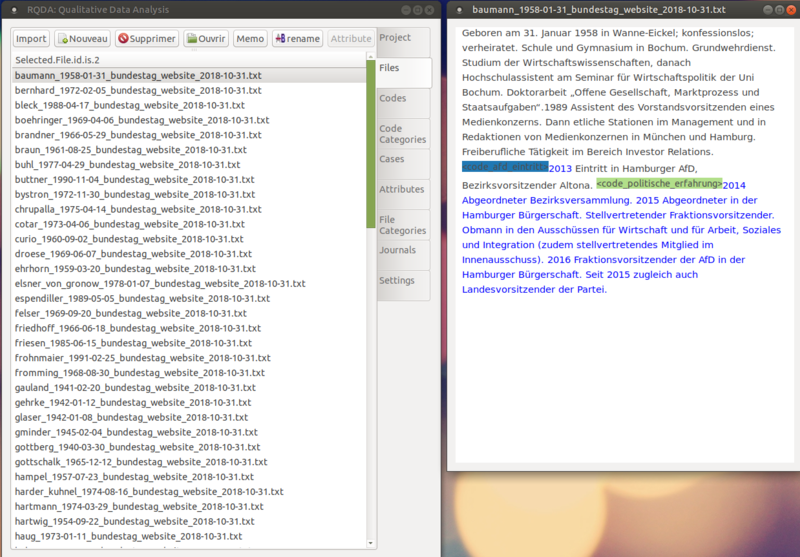 The idea was to automatically download the MPs’ profiles from the Bundestag website using web scraping techniques and then to describe the social structure of the AfD faction using quantitative and qualitative methods. I was particularly interested in the prior political experience of the AfD representatives. Extracting this type of information automatically is difficult and I opted to code some of the material manually. I was looking for a tool to work with the data collected. In social sciences, ATLAS.ti, MAXQDA, and NVivo are the most commonly used programs to analyze qualitative data. Yet, these programs are expensive and not everyone is able to afford a license. Also, I simply did not need all the bells and whistles offered by these tools (I suspect I am not the only one in this situation). The essence of qualitative data analysis (QDA) is to annotate text using relevant codes. Think of a computer-assisted qualitative data analysis software (CAQDAS) as a super highlighter (your brain is still doing the hard stuff). The rest – extracting content from PDF files, combining codes, visualizing them, etc. – can be performed by other programs. These functions do not have to be necessarily bundled with QDA programs. I took a look at RQDA, a free, light, and open-source CAQDAS built on top of R. RQDA was designed by Ronggui Huang from Fudan University, Shanghai, and has been used in a number of publications. The package is still in development (current version 0.3-1) and some bugs are apparent. Yet, RQDA does the essential right. It allows you to import text files (in many languages), code them using a graphical interface, and store your codes (and their meta-information) in a usable format. What I find particularly exciting about RQDA is that it lets you use the powerful machinery of R. Compared to other programs that work with closed software environments, RQDA is highly expandable. Think of all the R packages available to manipulate, analyze, and visualize textual data. Combining qualitative and quantitative data is also really easy, which makes RQDA a very good tool for mixed methods. Most importantly, since RQDA is free and open-source, anyone with an Internet access can download R and RQDA and reanalyze coded texts. Sometimes qualitative data contains sensitive information and it is not advisable to share it. Yet, often, scholars analyze data that is already public (as I do). In this case, it might be interesting to put your coding schemes online. Researchers usually agree that quantitative methods should be reproducible. This means that it should be possible to reproduce the findings of a publication (tables and figures) by re-running code on the raw data. I argue that qualitative research, when it does not use sensitive data, should be traceable, in the sense that others should have the possibility to go back to the source texts, examine the context, and reinterpret the coding. Simply by being free and open source, RQDA facilitates the diffusion and reuse of qualitative material and makes qualitative research more traceable. There are good RQDA tutorials online, especially the Youtube series prepared by Metin Caliskan, in French and English (see also, Chandra and Shang 2017; Estrada 2017). I learned a lot from these demonstrations and made good progress with the coding of the CVs of the members of the Bundestag. I am really satisfied with RQDA and, for the moment, do not feel the need to move to proprietary software. Daniel Oesch (University of Lausanne) has developped a schema of social classes, which he discusses and applies in different publications. On his personnal website, he offers Stata, SPSS, and SAS scripts to generate the class schema with data from different surveys. 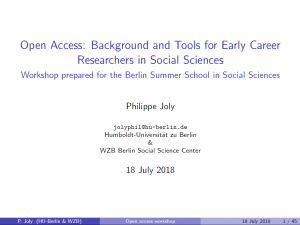 As part of the Berlin Summer School in Social Sciences, I organized a workshop entitled “Open Access: Background and Tools for Early Career Researchers in Social Sciences.” The goal of the workshop was to introduce participants to open access publishing and present useful tools to make their publications available to a wider audience. What are the limitations of the closed publication system? What are the different types of OA publications? What are the available licenses for OA publications? What is the share of OA publications in the scientific literature and how is this changing over time? What sort of funding is available for OA publishing? The workshop was structured around a 45 minute presentation punctuated by group discussions and exercises. 90 minutes were planned for the whole workshop. This workshop was prepared as part of the Freies Wissen Fellowship sponsored by Wikimedia Deutschland, the Stifterverband, and the VolkswagenStiftung. The contents of the workshop are under a CC BY 4.0 license. All the material of this workshop (the outline, the slides, and the bibliography) can be cloned or downloaded from GitHub. Feel free to share and remix the material to create your own workshop. The vignette was writen in R markdown and the original script is available on my GitHub page. My WZB Discussion Paper entitled “Generations and Protest in Eastern Germany: Between Revolution and Apathy” is now available on SocArXiv. The paper is available here and the replication material here. This paper compares the protest behavior of East and West Germans across generations and over time. It concludes that East Germans, especially those who grew up during the Cold War, participate less in protest activities than West Germans from the same generation after controlling for other individual characteristics. Dear editor, what is your preprint policy? Going through a peer-review process usually takes months if not years. At the end, if a paper makes it to publication, access will often be limited by publishers who impose a paywall on peer-reviewed articles. Preprints allow authors to publish early research findings and to make them available to the entire world for free. The concept is simple: 1) you upload a paper to a public repository; 2) the paper goes through a moderation process that assesses the scientific character of the work; 3) the paper is made available online. These three steps are usually completed in a few hours. With preprints, authors can rapidly communicate valuable results and engage with a broader community of scholars. Researchers are sometimes reluctant to publish their work as preprints for two reasons. First, they fear that their papers won’t be accepted by scholarly journals because preprints would violate the so-called Ingelfinger rule, i.e. their work would have been “published” before submission. Most journals however will accept to review and publish papers that are available as preprints. The SHERPA/RoMEO database catalogues journal policies regarding pre and postprints (accepted papers that incorporate reviewers’ comments). The vast majority of journals are listed as “yellow” or “green” in the database: they tolerate preprints (yellow) or pre and postprints (green). Second, authors are worried that they might get scooped, that their work might be stolen by someone else who would get credits for their work. Yet, the experience of arXiv, the oldest preprint repository which publishes papers in mathematics, physics, and others, shows the exact opposite. Since its creation in 1991, the repository has helped prevent scooping by offering scholars the chance to put a publicly available timestamp on their work. I have decided to make a paper available as preprint in the coming days. My idea is to simultaneously submit the paper to a peer-reviewed journal and upload it on a public repository. I first shared the concerns of many of my colleagues regarding scooping and the possible rejection of my work by editors. However, the more I learned about preprints, the more I felt confident that this was the right way to proceed. I’m interested in publishing in journal YY. I would like to ask: what is your preprint policy? Would you review a paper that has been uploaded to a public repository like SocArXiv? Yes, we would have no problem with that. I now feel very comfortable uploading the preprint on a repository. I will try to store my paper on SocArxiv, which is one of the first online preprint servers for the social sciences. While economists have a long experience with publicly available working papers, sociologists and political scientists have been more reluctant to join the movement. SocArXiv has been active since 2017 and is modelled on arXiv. Interestingly, the team at SocArXiv has partnered with the Center for Open Science and their preprint service is hosted by the Open Science Framework, which I have covered in another post. Bourne PE, Polka JK, Vale RD, Kiley R (2017) Ten simple rules to consider regarding preprint submission. PLoS Comput Biol 13(5): e1005473. Author pjolyPosted on May 6, 2018 May 6, 2018 Categories Open access, Open ScienceLeave a comment on Dear editor, what is your preprint policy? Git is a version control system. It keeps track of changes within files and allows for complex collaborative work. While it is mostly used by programmers for storing and sharing code, it can theoretically work with any type of file (text, images, etc.). GitHub is the most-used hosting service for Git. On Github, users store and make their Git repositories available to others. The Git workflow is highly valued in the open science community for a few reasons. It is fast, secure, and well-suited for coordinating large collaborative projects. The characteristic feature of Git is its branch system which allows users to work on different lines of development in parallel. Branches can be easily merged or deleted with minimal risk of losing valuable material. Inspired by other fellows and mentors of the Fellowship Freies Wissen, I started to use Git and GitHub about two months ago. However, I quickly faced difficulties. The problem was that I took the wrong approach with Git. When learning a new computer skill (like R), I usually start experimenting early in the process and learn by solving the inevitable problems that come along the way. This “hands-on” approach proved to be more complicated with Git. While I was trying to keep track of the changes on my PhD project, I got rapidly confused by the concept of “staging area” and struggled moving from one branch to the other. I realized that to start using Git efficiently I would need a more solid theoretical understanding of the system. I stopped using Git with my project for a while and went back to the basics. I started reading Pro Git, 2nd edition, written by Scott Chacon and Ben Straub (Apress, 2018) and followed through the explanations with example repositories containing simple .txt files. I performed all the operations in Bash, the command-line system, instead of using a GUI. Pro Git is a great resource: it is distributed under Creative Commons license and was translated in many languages. You can find the book in html, pdf, and other formats here. If you are also starting to learn Git I would recommend going through the first three chapters (“Getting Started”, “Git Basics”, “Git Branching”) and the first sections of the chapter on GitHub. That’s about 120 pages. Taking the time to learn Git properly proved very useful. After a few hours of reading, I was able to take advantage of most of the basic functions of Git. More and more, I am discovering the advantages of Git and wished I had learned it earlier. You can now follow my work on GitHub here. I will continue to post vignettes in R and will distribute replication material for my papers. The vignette introduces a technique for coping with the problem of systematically missing data in longitudinal social and political surveys. The multiple imputation procedure was implemented in R, a programming language and free software environment for statistical computing. The text and the code of the vignette were prepared in R markdown, a form of literate programming. Literate programming makes research more transparent and reproducible. It is also a nice tool for the development of open educational resources (OER). Finally, all the material of the vignette is on my GitHub page, where users can clone the repository, comment, and suggest modifications. While theories and methods to study protest are becoming ever more sophisticated, protest data still suffers from many of the same limitations as it did twenty years ago. Since the 1990s, new rich datasets on extra-electoral political participation have become available. Yet, despite the great contribution of the research teams behind the production of this empirical material, concerns remain with regards to the availability, reliability, and replicability of this data. Scholars interested in comparing protest participation quantitatively in different countries are essentially dependent on two types of data: international social surveys and protest event data from newspapers or websites. These sources are all suboptimal, each having its advantages and disadvantages. Most major international social surveys, like the European Values Study, the World Values Survey, the International Social Survey Programme, and the European Social Survey now incorporate questions relative to protest participation. These social surveys have three great advantages: they are usually nationally-representative, their questionnaires are standardized, and, since their units of analysis are individuals, they include a bunch of variables (e.g. age, gender, and education) that can be incorporated as covariates into statistical analyses. But, this type of survey has one downsize: it does not allow to link respondents to specific protest events. We can never say, individual X took part in demonstration Y. Typically, respondents will have to answer to questions such as “during the last 12 months, have you… taken part in a lawful demonstration?” The target, timing, and location of the political action remains unknown. We can identify who is active and who is not in a given country at a certain point in time, but we cannot, for example, compare mobilization for the environmental movement with that for the feminist movement. These surveys suffer from another problem: their inconsistent coverage across countries and time. Typically, as with the EVS and WVS, survey rounds are conducted approximately every five years with different samples of countries. OECD countries are systematically over-represented. This makes it difficult to carry any form of time series cross-sectional analysis. Finally, survey data is not fully open. Survey organizations typically reserve the right to distribute their data. Although this is often done for very legitimate reasons (updates, correction of mistakes), it can complicate the diffusion of secondary data such as protest indexes. The second main type of protest data is based on secondary sources (newspapers, websites, police records) which report events such as demonstrations, strikes, or rallies. Here, the units of analyses are protest events rather than individuals. Up to recently, this data was coded entirely manually – a very tedious process. Now, more and more automated coding tools are becoming available, but often automation has come at the cost of reliability. In many aspects, the balance sheet of protest event data, in terms of advantages and disadvantages, is the exact mirror of the one for survey data. Protest event data can be very useful for a few reasons. First, this type of data typically incorporates information on events’ form, size (number of participants), location, duration, target, and other characteristics such as the level of confrontation with the police. Second, since protest event data is usually based on daily reports, it can be easily reassembled into monthly or annual measures, making it straightforward to perform longitudinal analyses. Third, with access to archives, protest event data can theoretically go back in time, even as far as the beginning of the written press (as did Charles Tilly and his collaborators). Nevertheless, collecting protest data from secondary sources comes with a warning notice. Social movement scholars are well aware that protest event data is subject to two forms of biases. Selection bias is present when media sources report on certain types of protest, but not others. This can reflect the ideological orientation or geographical focus of the source. In fact, what protest event data is really measuring is media attention, not absolute levels of protest. Description bias appears when protest events are reported incorrectly. At the age of “alternative facts,” the number of participants in a demonstration is notoriously difficult to estimate and figures can be quite inconsistent across different sources. One final problem with protest event data is that the original sources behind the datasets are usually under copyright. If other scholars wish to revise some codings, they have to obtain the authorization to retrieve the original sources, usually newspaper articles (and that is when the dataset includes clear references, which was not always the case). Machine-coded protest event data has all the limitations of human-coded data, but, of course, is generated much more efficiently. Reliability is potentially an issue however, as automated coding mechanism are prone to false negatives and false positives. And, of course, machines do not have the finest interpretation when it comes to identifying the characteristics of the protest event. For example, the reliability and validity of the Global Database of Events, Language, and Tone (GDELT) project, one of the most ambitious attempts at automatically cataloging societal events, has been seriously questioned. Where should we go from there? There are no perfect solutions, but certainly a few incremental changes would improve the quality and transparency of protest data. The strategy I propose would follow three lines: opening, benchmarking, and triangulating. We need to make sure that all the data and the sources on which the data is based are open. For social surveys, this would mean facilitating the access to data with APIs. For protest event data, this would imply that the original sources are open and accessible. Some newspapers like the New York Times and the Guardian have already taken an important step by implementing APIs to easily retrieve their articles. We would expect public broadcasters to go a step further and place their articles (at least the older ones) under a Creative Commons license. Governments also own protest data, for example in the form of police records, that could be made public and machine-readable. By benchmarking, I mean comparing systematically the same type of data from different sources (e.g. some survey data compared to other survey data) and ideally developing measurement models to assess uncertainty of the data. A good example of how this could work is Alex Hanna’s Machine-learning protest event data system (MPEDS) where human-coded datasets are used to “train” machine-learning algorithms which classify and code protest events on the basis of large databases of newspaper articles. Finally, triangulating would mean combining different types of protest data (from surveys, newspapers, and web sources) and cross-validate the measures. For example, we could think of a research design where protest event data is collected first and then, a nationally-representative survey, complements the analysis. We could use the protest event data to identify a list of the most prominent episodes of mobilization in a country and the survey data to get a clearer profile of the protesters (age, gender, education) and reassess the number of participants. The three strategies of opening, benchmarking, and triangulating would certainly improve the transparency and robustness of research on extra-electoral political participation and social movements. A third option would be expert-surveys such as the V-Dem civil society index. Yet, these measures are usually better at capturing the conditions under which protest takes place (the opportunity structure), rather than the actual level or orientation of the mobilization. See: Michael Bernhard et al., “Making Embedded Knowledge Transparent: How the V-Dem Dataset Opens New Vistas in Civil Society Research,” Perspectives on Politics 15, no. 2 (June 2017). European Social Survey, ESS Round 8 Source Questionnaire (London: ESS ERIC Headquarters c/o City University London, 2016). Charles Tilly, Louise Tilly and Richard Tilly, The Rebellious Century, 1830-1930 (Cambridge: Harvard University Press, 1975). Jennifer Earl et al., “The Use of Newspaper Data in the Study of Collective Action,” Annual Review of Sociology 30 (2004).